When the Kia Sportage made its U.S. debut, it tried to take on traditional sport-utility vehicles head-to-head by offering serious four-wheel-drive capability. Before long, however, Kia realized that buyers were really looking for more than just physically smaller versions of familiar full-size SUVs. They wanted a vehicle that combines the practicality of the sport-utility body style with the more civilized ride and handling qualities of a passenger car. The Kia Sportage crossover SUV lives up to its name with its sharp steering and athletic handling that make it more engaging than most other vehicles in its class. Generally, you won't find the words "sporty" and "crossover" used in the same sentence, but the Sportage has a more responsive and fun-to-drive character than you might expect. It also gives you sleek styling, an extensive list of standard features and options and a price tag that typically undercuts the compact crossover competition. 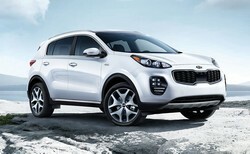 Kia Motors America (KMA) unveiled the all-new Sportage at the 2015 Los Angeles Auto Show. The fourth-generation Sportage, KMA's longest-running nameplate, wraps stunning contemporary design around a structure that is both stiffer and more spacious than before. After a two-year hiatus, the model-year 2005 Sportage returned, sharing its Elantra-based platform with the 2005 Hyundai Tucson. Critics and fans of the original, pre-Hyundai Sportage complain that it is considerably larger than the original Sportage and has none of the earlier off-road capability, the two keys for its success. The first-generation Kia Sportage was developed with a Mazda Bongo engineering base platform. It shares many mechanical components such as the engine, transmissions (early versions), and differentials with the Mazda line of vehicles. This was during Kia's alliance with Ford and Mazda, which involved Ford/Mazda providing technology and Kia providing inexpensive manufacturing facilities for Ford.